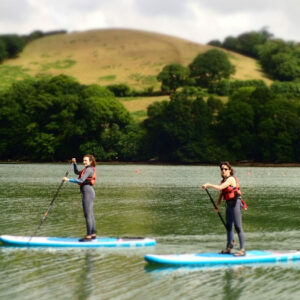 Dartmouth offers a huge selection of fantastic SUP trips, based in the heart of an designated Area of Outstanding Natural Beauty, a SUP is the perfect way to explore this beautiful environment. You can find your balance in the calm, quiet creeks of the Dart Estuary before heading out to explore the spectacular coast line. The SUP’s glide silently through the water letting you get up close to lots of wildlife. Because you are standing up it is easy to look into Devons crystal clear water where you will see all sorts of cool creatures! It’s surprisingly easy to stay dry on an SUP board, however anyone who fancies a swim can dive in for for a splash and then very easily get back on board. If you’re feeling a bit wobbly you can start by kneeling comfortably on the board before plucking up the courage to stand up!